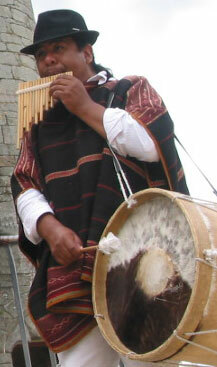 The Siku is a wind instrument made of thin bot reed coming from the Bolivian Amazon. This Siku presents two parts, or two lines. The first part is the higher one and 10 notes can be played whereas the second part which is the lower one has 9 notes. 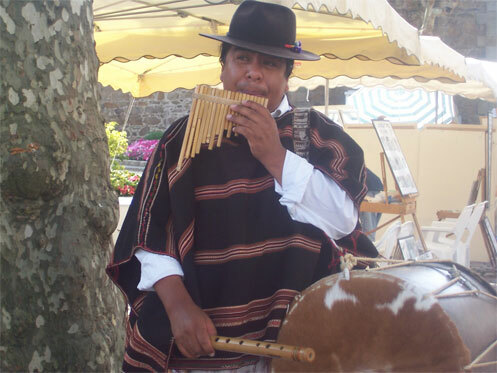 To play a melody you need to blow the pipes. It is traditionnally played by two persons: the first one plays on the higher part whereas the second person plays on the lower part. As a result, both players will respond to each other by inserting notes. However, a musician can also play of this instrument on his own but to have a melody he will have to blow the two parts successively. To blow the pipes the good positionning of the lips must be found and in the same time the air flow that come out of the pipes and that make the pipes ringing out must be controlled. Then, when you are about to blow , both lips have to be moved as much as possible. These lips movements will allow the instrumentist to improve his pure sound's level and his speedness. To accumulate air inside your body you need to breath through the nose, which will allow you to accumulate the more air you can. This air must be cleared out by blowing the pipes and by keeping your lips tight in order to create an uniform air flow that will circulate to the pipe's bottom. Thus a pure sound will reverberate. Not only you need breath to emit sounds, but it is also necessary to find the good position of the lips, not to get too much out of breath, and to keep breath in the same time. Yet it is up to each one to find his own good position of lips, by finding the lips muscles 's tension.